In December 2015 The State editor Cindi Ross Scoppe published an editorial boosting the idea of a significant increase in the South Carolina tax on cigarettes. I found myself nodding my head in agreement and did a short blog post on it at the time about wondering if my strong position in favor of much lower federal corporate and personal income tax rates combined with complete and total elimination of deductions, exemptions, exclusions, credits, etc., can be reconciled with favoring a boost in the state tax on cigarettes, a move which would obviously disfavor the tobacco industry. The primary advantage I see in such radical reform of the corporate and personal taxes is elimination of the power of Congress to pick winners and losers, usually based on pressures and motivators from powerful lobbyists. And freeing up the tobacco lobbyists and state legislators to wheel and deal on a state cigarette tax just seems inconsistent with that position and probably unfair. But here is the thing: States are entirely different from the United States of America with respect to government and governing for three fundamental reasons. First, they cannot print money and have to roughly balance taxing and spending over relatively short periods of time. Yes, they can issue bonds, but the interest on those bonds has to be paid in cash. Second, the state borders are even leakier than the US southern border. As a matter of fact, we are completely free to move from state to state as we wish without having to give up or acquire citizenship. Well there are those little matters of driver’s licenses and tax returns and residency establishment, but those are just a matter of paperwork with no real restrictions. And, finally, because we do have that freedom to move, the states are in competition with each other to provide safe environments and dynamic economies and reasonable tax rates and good schools and all the other things that people consider when deciding where to live. Probably in the category of unintended consequences, the low cigarette taxes in the Carolinas have been pretty good job creators over the past two or three decades, creating all kinds of opportunities for smugglers to buy truckloads of smokes here and take them to New York and other high tax states for resale. But it is probably the fact that lots of tobacco has traditionally been grown here that results in legislator resistance to raising the taxes. So, I can consistently favor dramatic federal tax reform and simplification along with higher cigarette taxes in my state to further reduce the teen smoking I see all around the city and to cut down on the temptation for smuggling. 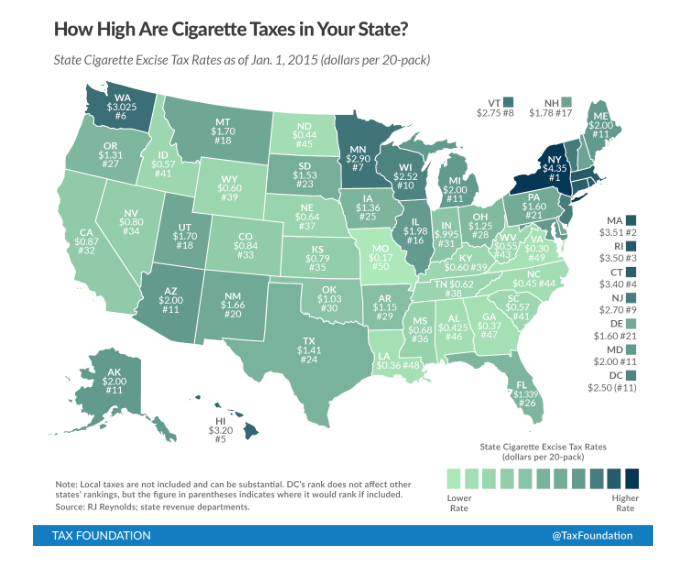 Here is the current state-by state cigarette tax situation. Looks like the SC legislatures didn’t follow Mrs. Scoppe’s advice, maybe partly because there is no proof that the increase from 7 cents to 57 cents caused the drop in teen smoking. I wonder how much NY smoking teens have to pay for those smuggled cigarettes. And NO, I do not favor federal meddling in this issue. They have much more important things, such as tax reform, to work on. People should be able to smoke in their privacy without the government punishing them with confiscatory taxes. I am surprised your support taxes on behavior which you disapprove.